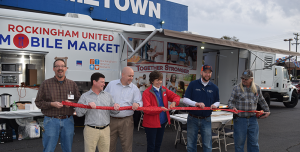 Rockingham United launched its new Mobile Market Food Pantry at ribbon cutting event Tuesday Nov. 23 in Reidsville, NC. From left: Marty Roberts (Lot 2540 and Rockingham United); Mike Armentrout and Tommy Smith (Mickey); Tracy Doss (Second Harvest Food Bank of NW NC); Torrey Easler (Rockingham Rescue Mission); Gordon Mills (Lot 2540). 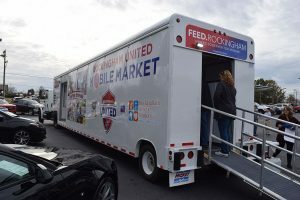 The Rockingham United Mobile Market, a fully stocked mobile food pantry operated by Rockingham United Inc. – a partnership between the Kate B. Reynolds Charitable Trust and LOT 2540 – made its maiden voyage on Tuesday, November 21, 2017 at Hometown Chevrolet-Buick-GMC in Reidsville, NC in conjunction with this year’s Feed Rockingham celebration. The mobile pantry was reconditioned from a 2004 beverage trailer manufactured by Mickey Truck Bodies (High Point, NC) for one of its customers – a major branded beer distributor. Mickey also handled the complete reconditioning and up-fitting of the trailer at its full-service Reconditioning & Repair Center in Thomasville, NC. Rockingham United’s mobile food truck will provide much needed food, health and nutrition programming and resource referral services to qualified citizens that have difficulties accessing healthy food in areas of Rockingham County that do not provide coordinated hunger relief services. In 2017-2018 the mobile pantry’s goal is to distribute over 200,000 pounds of healthy food to 7,500 households across the county. Patrons can enter the rear of the Pantry to make their food selections and exit in the front of the vehicle. The reconditioned Mickey trailer features fully functional kitchen, including a Coleman-Mach 15K BTU HP2 Heat Pump with A&E Dometic 21’ Power Awning; a 3-door Glass Front Refrigerator; Serv-Ware 2-door Glass Front Freezer; Sharp 1000-Watt Microwave; Avantco ¼ Size Convection Oven; LP Two Eye Burner; LP 24” Griddle; and a Pourover Airpot Coffee Brewer. The unit also has a TV (2540 supplied), seating for up to 12 people, a special “consultation” area with seating, and a generator. Patrons can easily enter and exit the vehicle via front/rear walk-thru access.